If I had to single out the most exciting restaurant experience for this year, it would undoubtedly be Archipelago, a mainly seafood restaurant at the end of Kenyatta Road in Stone Town, Zanzibar. The decor isn't much - the plain tables and plastic chairs evoke memories of Juicy Luicy when I was five. But on the veranda overlooking the beach, they serve some of the freshest seafood dishes I've ever had the pleasure to pay for. 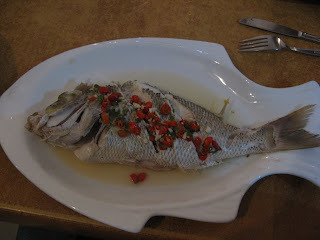 And although buzzing with locals and tired tourists alike, it offers some respite from the relentless hustle and bustle In particular, the Pili-pili Perch (Peri-peri Perch) was divine - a whole fish, gently steamed, scored, then drizzled with a fresh lime and chili dressing. Closer to home, my introduction to Peking Duck in Hazelwood will remain a memorable night, as will the plate of prawns shared under exploding fireworks at Chinese New Year, in Cyrildene. 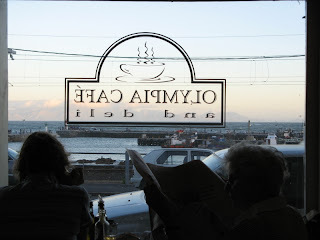 Lastly, Olympia Cafe in Kalk Bay deserves acknowledgement - for their atmosphere, the view, the enthusiastic yet elegant food and their inspiration of countless inferior imitations at home. 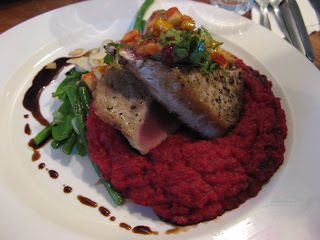 Seared tuna on a bed of beetroot mash, with toasted almonds and other lovely bits.